After the exertions of the last issue's gapple with five digital amp emulator / effects unit's, it been great this issue to get a couple of products that plug in and go, without any reliance on binary code and the associated necessity of poring over user manuals. The G2D Cream-Tone is an overdrive stompbox pure and simple, but one with some cunning 'bonus' features that make it a real contender for a slice of the lucrative effect footpedal market. It's been developed in New Zealand by G2D Limited, Aucklanders Grant Wills and Dave Manning, which is great, but of itself an insufficient reason for forking out the reasonably hefty sum of $425 NZD. What will win over notoriously picky guitarists with a galaxy of international product to choose from, is its scintillating tone, preservation of guitar personality and two stage configuration. Unapologetically aimed at blues-tone freaks with a hankering for authentic retro sound, it is on this level that the Cream-Tone more than fronts up to the opposition. I can't think of a product that has been more aptly or descriptively named, because mmmm, that tone sure is creamy. The designers make no secret of the fact that this product was developed with single coil pick-ups in mind, a configuration much preferred by blues guitarists, and after a brief workout with the Les Paul Gothic revealed a lack of transparency and edge, it was back to the Strat. 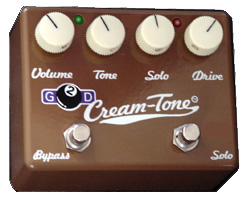 The look of the G2D Cream-Tone is pure retro, from its chunky brown chassis to its cream-coloured control knobs. From the left is Volume, which provides a startling amount of boost, a wide-sweep Tone control, a Solo knob for setting the amount of volume boost for lead breaks (great feature) and a Drive control. There are two footswitches, a true Bypass (courtesy of Carling DPDT switches) and a Blues/Solo switch for kicking in the subtle boost to jump out in the mix, along with three bright, different coloured LEDs for instant visual mode identification. If 'Texas tone', or fat, harmonically loaded blues may have proved elusive in the past, I recommend adding a dash of cream to the mix, Cream-Tone heft mer mmmmmm!